Well, I was just getting ready for bed and saw the PTWC email notification. It took a couple minutes before the USGS email notification came through, but the earthquake was already listed on the website. By the time the ENS email came in, the magnitude was adjusted, as well as the location. This M 6.8 earthquake was originally reported as a deep earthquake at 80 km, but after real people took a look at the data, the depth was also adjusted. It is interesting that this earthquake happened just a few days after the sequence to the west, though these earthquakes are probably too far away to be related. Here is my report from a couple days ago. I include the interpretive poster from that earthquake below today’s interpretive poster. I use some of the same figures for both of these posters since they are each in a similar region of the world. Then, moments later, there was an M 5.5 in the Loyalty Islands region. Hmmmmm. 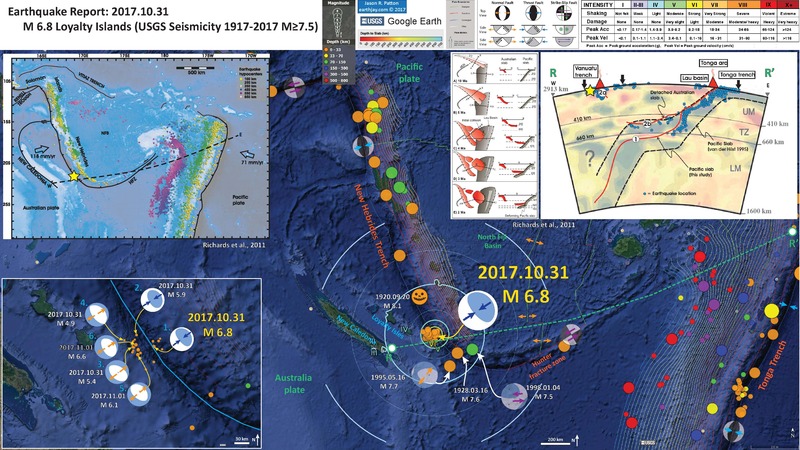 Today’s M 6.8 earthquake did occur near the earthquake from 2009 (almost immediately down-dip of the 2009 earthquake), an M 8.1 earthquake in the downgoing slab, that caused a large and damaging tsunami in the Samoa Islands. Here are the USGS websites for the M 6.8 earthquake. Here are the USGS earthquake pages for the earthquakes for which I plot fault plane solutions in the inset figure below. In the upper right corner is a map from Benz et al. (2011) that shows seismicity with color representing depth and circle diameter representing magnitude. This report is available online for more information. I include the general location of this M 6.8 earthquake as a blue star. Cross section H-H’ is plotted on the left of the map. I include the location of this x-sec on the main map as a blue line. In the lower left corner are several more cross sections as determined from seismic tomography (de Paor et al., 2012). Seismic tomography is basically an X-ray of Earth’s interior that uses seismic waves rather than X-rays. More on seismic tomography can be found here or here. The cross section A-A’ is shown on the main map as a green line. In the upper left corner is a low-angle oblique view of the megathrust fault (the slab). This is from Green (2003). In the lower left corner I plot the USGS moment tensors (blue) and focal mechanisms (orange) for earthquakes in this region. 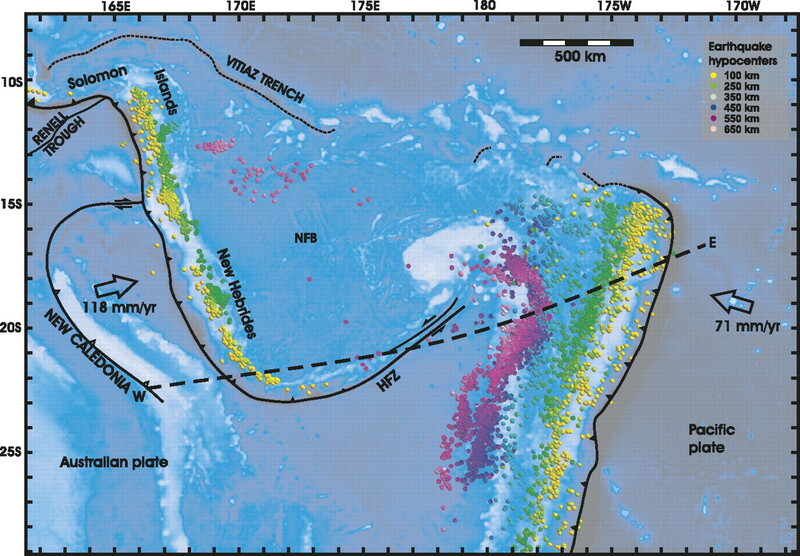 These earthquakes fit two distinct domains (outlined in dashed white). The easternmost quakes are in the downgoing Pacific plate and are the result of extension (either slab tension or due to bending in the upper part of the plate). 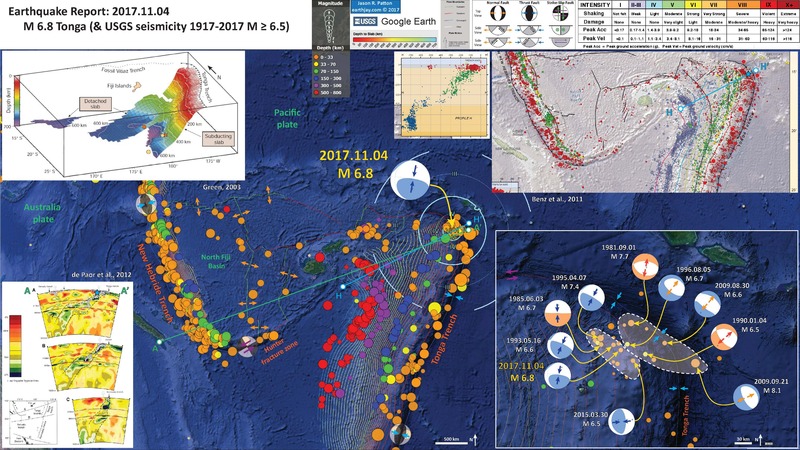 The westernmost quakes are either near the megathrust (subduction zone) or in the upper plate (most appear to be in the upper plate). Something that all earthquakes share is that their principal strain direction (the orientation of maximum or minimum stress) rotates with the orientation of the subduction zone fault. This may represent strain partitioning at this plate boundary. Basically, thrust earthquakes tend to be oriented perpendicular to the megathrust fault strike, and there are other strike-slip earthquakes that accommodate the non-perpendicular plate motion. There are no examples of these strike-slip earthquakes here. The subduction zone here is quite complicated as there is backarc spreading and a complex interaction between mantle flow at the edge of the subduction zone and a hotspot plume. Here is the oblique view of the slab from Green (2003). Here is a great figure showing an interpretation of how the mantle flow and hotspot plume may interact here (Chang et al., 2015). stress from the plume at the bottom of the Tonga slab may contribute to the slab stagnation within the mantle transition zone, while the Kermadec slab is penetrating into the lower mantle directly. At the northern end of the Tonga slab, plume materials migrate into the mantle wedge, facilitated by strong toroidal flow around the slab edge induced by fast slab retreat. Here are figures from Richards et al. (2011) with their figure captions below in blockquote. Here is my interpretive poster for the 2017.10.31 earthquake. de Paor, D.G., Wild, S.C., and Dordevic, M.M., 2012. Emergent and animated COLLADA models of the Tonga Trench and Samoa Archipelago: Implications for geoscience modeling, education, and research in Geosphere, v. 8, no. 2, p. 491-506.